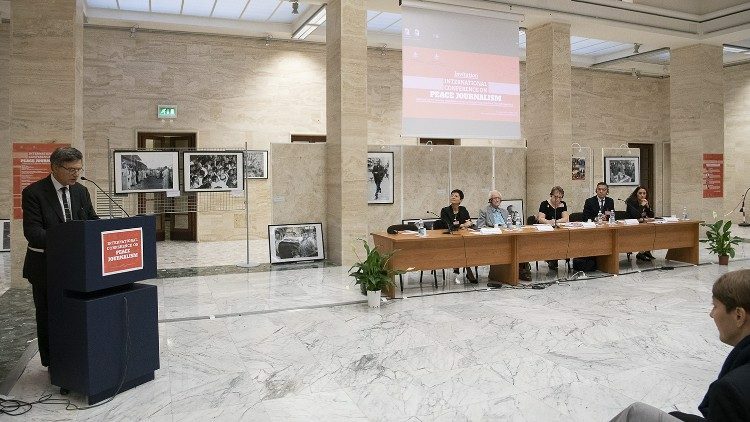 In a world in which bad news floods the media, the Vatican Dicastery for Communication holds a Conference on ‘Peace Journalism’, promoting this concept – along with the peace that comes with it. 13 Oct 2018 – Four peace journalists from Italy, Lebanon, China and Norway spoke today in an International Conference on “Peace Journalism”, held in and hosted by the Vatican. Galtung highlighted the definition of peace, explaining that there is ‘violence’, – which is self-explanatory; ‘negative peace’, which implies a complete lack of interaction, either peaceful or violent, between two parties; and ‘positive peace’, which means interactions that involve “linking good to good”. Rey-Sheng Her stressed the importance of ‘constructive journalism’. He explained that journalists must make a concise effort at solving problems and not simply “digging them out”. Stefania Tanesini spoke of ‘dialogic journalism’. This style, adopted within the focolari movement, describes the “concrete experience of hundreds of journalists”, who hope that their style will strengthen an empathetic and constructive dialogue whilst “constantly searching for peace”. Vanessa Bassil was the fourth speaker. She is the founder of Media Association for Peace (MAP): the first non-governmental organisation in the Middle East, Northern Africa and Lebanon dedicated to fostering the role of media in building peace. She explained to Marine Henriot the need for Peace Journalism in the Middle East, an area of the world which is surrounded by conflict, in which people feel the crisis, “people are desperate, they are hopeless”, she said. She also addressed the Syrian refugee crisis. Lebanon, with a population of 4 million, is currently hosting 2 million Syrian refugees fleeing conflict and hardship. “There is a lot of conflict between the host community and the refugees”, she said. “We have decided to report positive stories about refugees”. By going out and meeting refugees living in camps, her and her colleagues tell “stories that give hope, that give inspiration”.